In 1923 a competition was announced for a new Latvian pack. The winner of this competition was the silversmith Stefans Bercs (1893-1961), one of the most distinguished masters of Art Deco in Latvia. This was Latvia's second pack and it became the most popular. The designs have echoes of Livonian history and folklore. It was issued in Latvia until the end of World War 2, and then again in Sweden for Latvians in exile [example]. 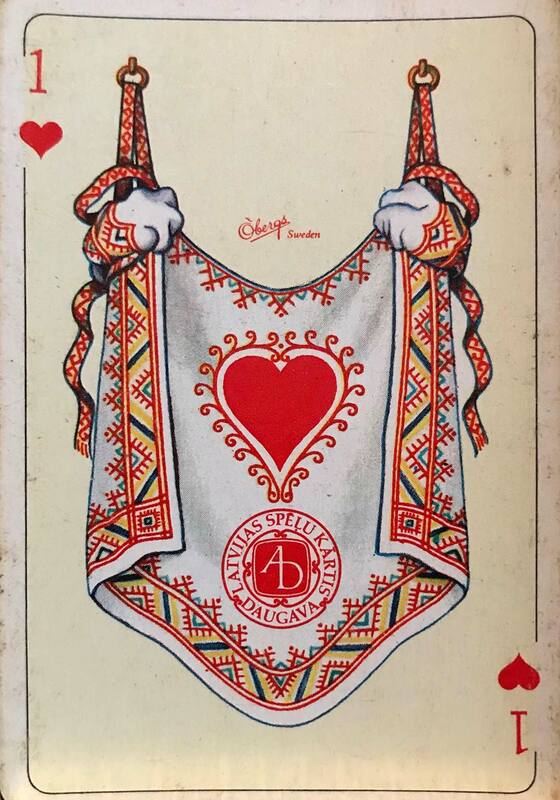 Above: Playing Cards designed in Latvia by Stefans Bercs and first issued in 1923. 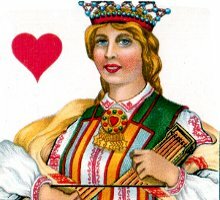 This particular edition was printed by Ernst Platesa Lithography, Riga, as seen printed at the bottom of the Ace of Hearts. The letters 'L.S.K.B' on the tax stamp stand for 'Latvijas Sarkanā Krusta Biedrība' (Company of Latvian Red Cross). Later editions were printed by Latvijas Vertspapiru Spiestuve. 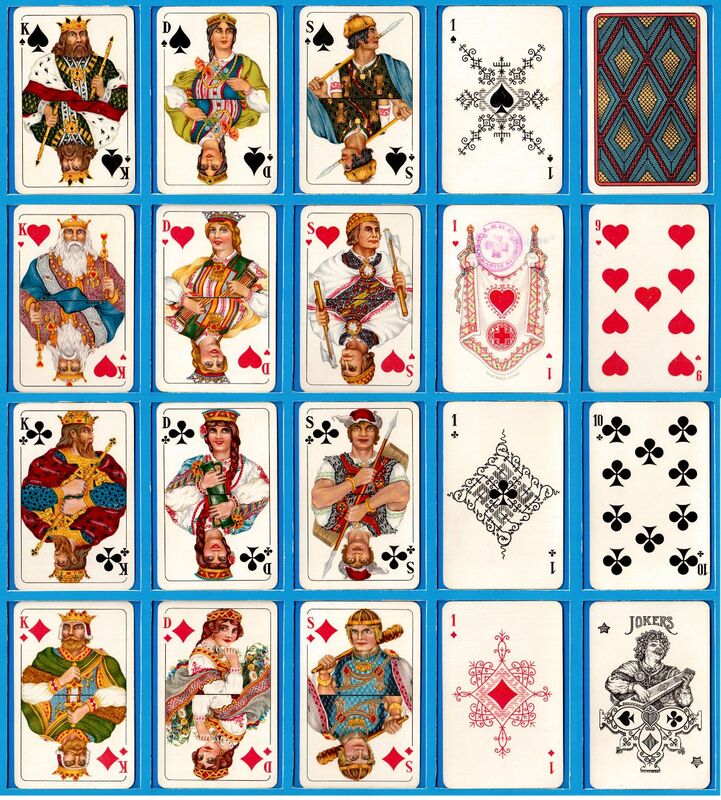 Packs were sold as No.5 (full pack) or No.6 (32 or 36 cards). 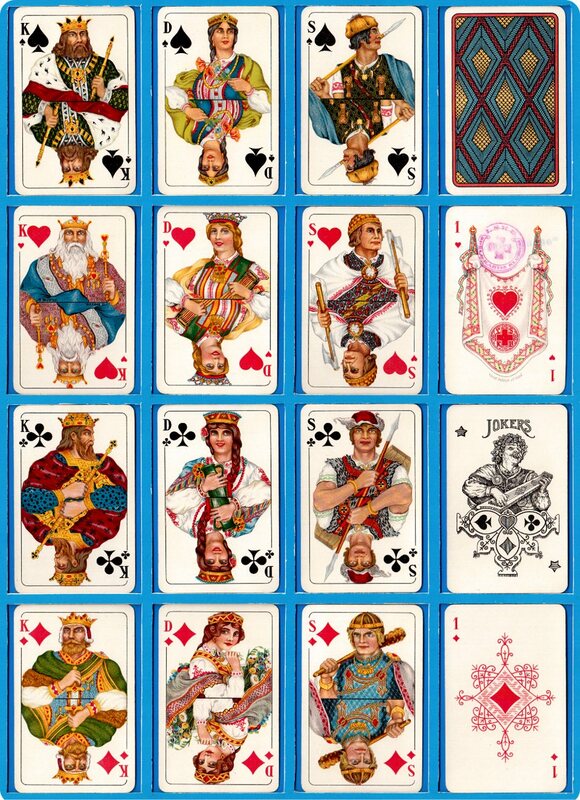 The designs have echoes of Livonian history and folklore and the decorative details on the court card clothing include swastikas. Bercs was a silversmith and his pack became the most popular in the country. It was issued until the end of World War II. It was reprinted in Sweden in 1959. Images courtesy Albinas Borisevičius. From 1919 -1921 there were no tax stamps on Latvian playing cards. 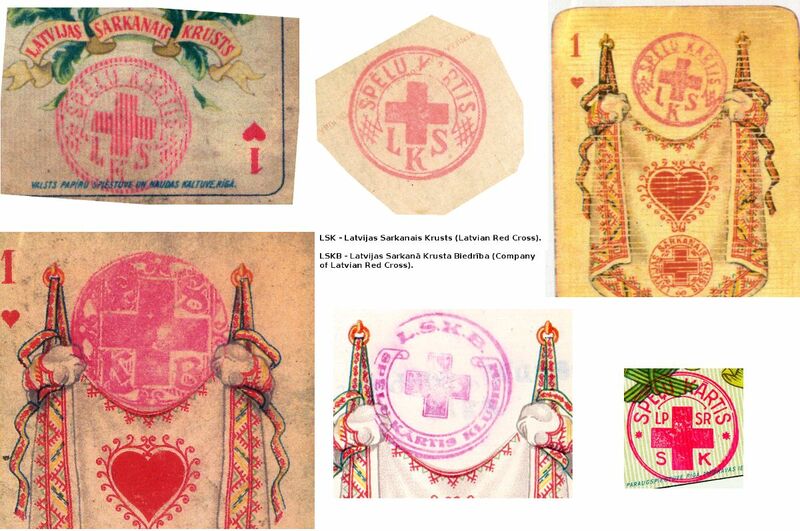 In 1922, by law, the Latvian Red Cross was to receive dividends from the production and sale of playing cards and a special tax stamp was placed on the ace of hearts for this purpose. 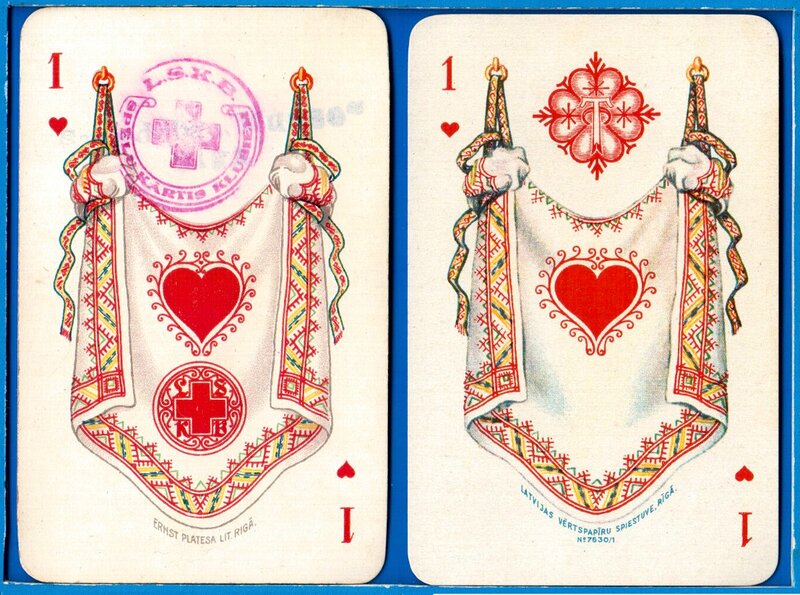 In addition to the stamp, the symbol of the Red Cross was incorporated into the design of the ace of hearts. This taxation arrangement continued until 1943. 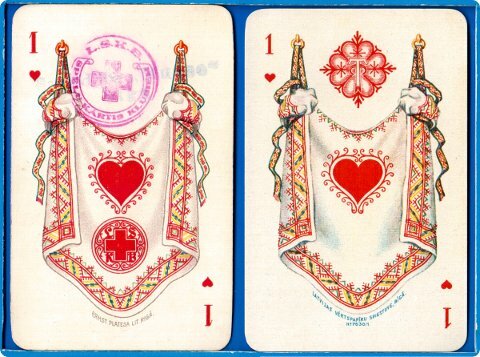 Left: Aces of Hearts from packs designed by Stefans Bercs. The first one is printed by Ernst Platesa and the second by Latvijas Vertspapiru Spiestuve (click image to zoom).